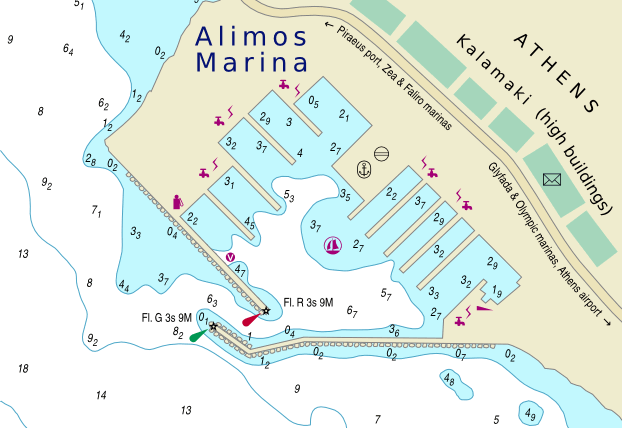 The Alimos Marina – Άλιμος in the affluent Athens’ suburb of Kalamaki – Καλαμάκι is the starting point for most Athens yacht charters in the Saronic Gulf, Argolic Gulf and the Cyclades. The majority of thereputable yacht charter companies have their main base at or near this marina. Poros port; wonderful approach and picturesque town – 30 nm. Doing some extra mileage on the first day of these sailing holidays will mean less other Athens yacht charters in sight! In Methana and Poros there is usually on a Saturday plenty of room even when arriving at sunset. From the Athens International Airport a direct bus line (X96 – direction: Piraeus commercial and ferry port) conveniently stops at the Alimos Marina (bus stop: 1st Kalamakiou). This bus line also serves the other important marinas of Zea, Faliro as well as the Olympic and Glyfada marinas. When cruising a private yacht these other marinas in Athens are more useful than the Alimos marina. Especially the bustling Zea marina is most practical and very appealing due to the adjacent Piraeus town.